1A set of Marie-Anne Libert’s cryptogamic exsiccata, Plantae cryptogamicae quas in Arduenna collegit, is held at the National Herbarium of Victoria (MEL), Royal Botanic Gardens Victoria, Melbourne, Australia. Associated with this set is a letter from Libert presenting the third fascicle to ‘My dear Colonel’. 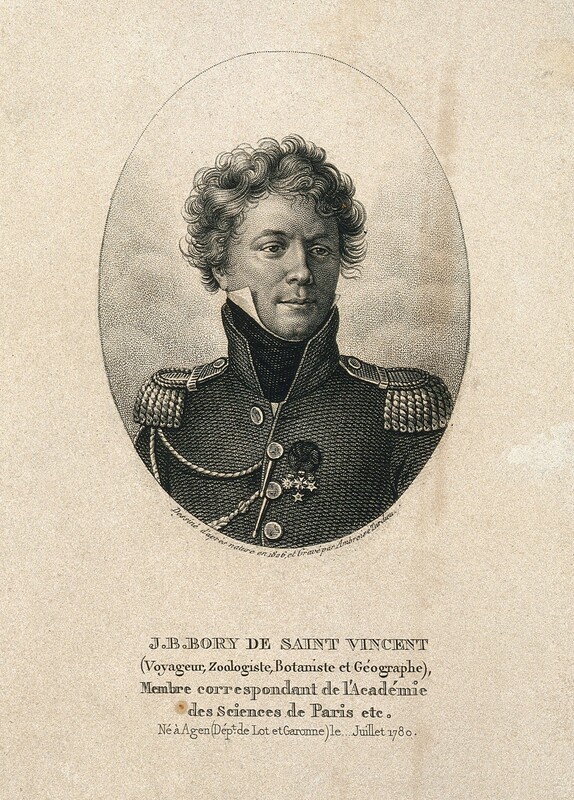 This article will situate Libert’s cryptogamic botany in the context of key male friendships, including with Alexandre Louis Simon Lejeune, Jean Baptiste Henri Joseph Desmazières, Augustin Pyramus de Candolle, and the ‘Colonel’, who is identified as Jean-Baptiste Bory de Saint-Vincent, and highlight their shared use of the trope of female modesty to advance Libert’s career. It will also explain how Bory’s set of Libert’s exsiccata came to be in the southern hemisphere. 3The holdings of the National Herbarium of Victoria (MEL),1Royal Botanic Gardens Victoria, Melbourne, Australia are dividedinto ‘Australian’ and ‘extra-Australian’ specimens, with the researchfocus of resident scientists being overwhelmingly on the Australian material. Nevertheless, the founder of the herbarium, German-educated Baron Ferdinand von Mueller (1825–1896), built up significant extra-Australian holdings, with the cryptogams i.e. ferns, fungi, mosses, lichens, liverworts and algae, being especially well represented (Home et al. 1998, 2002, 2006). In recent years, MEL has allocated increased resources to curating the extra-Australian specimens and this has led to the identificationof a large number of type specimens, many included in exsiccataeissued by northern-hemisphere scientists (e.g. May 1992; Sinkora 2018). 4Marie-Anne Libert’s Plantae cryptogamicae quas in Arduenna collegit is notable among the exsiccatae held at MEL, because her specimens are over 150 years old and rich in types, and because Libert was a rare female presence among early nineteenth-century cryptogamic collectors and taxonomists (Fig. 1). Her interest in plant parasitic fungi also made her a pioneer in phytopathology, including a role in the study of the spread of the terrible epidemic of potato late blight (Maroske & May 2017). 5In addition to her specimens, the library at MEL also contains a copy of the printed text accompanying the first fascicle of her exsiccata, and located within this material is an original manuscript letter signed by Libert concerning the donation of her exsiccata to ‘Monsieur le Colonel’, who is not otherwise identified. 6FIG. 1. – Marie-Anne Libert. Frontispiece to La Belgique Horticole, vol. 18, accompanying Morren (1868) (downloaded from Biodiversity Heritage Library). 7Libert is now recognised as only the second woman to coin a novel mycological taxon in the modern scientific era, and the first woman to name new species and genera of fungi (Maroske & May 2017).2 She went on to more than equal the taxonomic output of contemporary male mycologists, describing over 200 novel taxa. Having only one female taxonomic mycologist as a predecessor makes it seem as though Libert sprang from nowhere, but her productivity as a cryptogamist also emphasises how successfully she was able to fit herself into the prevailing male scientific culture as a figure of authority. Libert’s major work was her exsiccata, and the sale and distribution of its sets undoubtedly helped to create and strengthen her relationships with male peers. Beyond her own time, sets continued to be bought and sold, including that of the ‘Colonel’s’,which eventually found its way to Melbourne in the southern hemisphere. 8In this article we situate Libert within a French-speaking circle of mentors in the first half of the nineteenth-century, including the ‘Colonel’ (who we identify as Jean-Baptiste Bory de Saint-Vincent, Fig. 2) and explore how this circle helped her to crystallise and to achieve her scientific ambitions. In her own public writings, and those of her mentors, Libert superficially conformed to feminine stereotypes of humility and a lack of pretension, but these were not qualities well-suited to claiming the right to discover and name new taxa. The use of ‘modesty tropes’ by women as ‘authorial alibis’ is well-recognised in literary history (e.g. Pender 2012, DelRosso et al. 2007; Yeazell 1991), but has only recently begun to be discussed in the history of science (e.g. Cavazza 2014; Kohlstedt & Opitz 2002). Maroske & May (2017) note the persistence of the rhetoric of modesty in the mycological careers of Élise-Caroline Bommer née Destrée (1832–1910) and Mariette Rousseau née Hannon (1850–1926), other Belgian (s.l.) female mycologists. Maroskeet al. (2018) highlight the negative effects of overt expressions of confidence and ambition on the mycological career of Australian-born Flora Martin née Campbell (1845–1923). 9FIG. 2. – Jean Baptiste Bory de Saint-Vincent. Stipple engraving by A. Tardieu after himself, 1826 (Wellcome Collection <https://wellcomecollection.org/works/x9ztk7xk>. CC BY). 10Libert’s surviving letter to Bory, reproduced (Fig. 3), transcribed and translated here for the first time, can be seen as a classic example of a woman using a formal voice of inferiority. Nevertheless, Libert herself reveals the limitations of the modesty strategy in a letter to another mentor, the botanist and physician, Alexandre Louis Simon Lejeune (1779–1850). Also translated into English here for the first time, this text indicates that Libert could be assertive and self-protective in a way that had the capacity to shock and perplex her supporters, and require them to explain and downplay her seeming lack of modesty. 11FIG. 3. 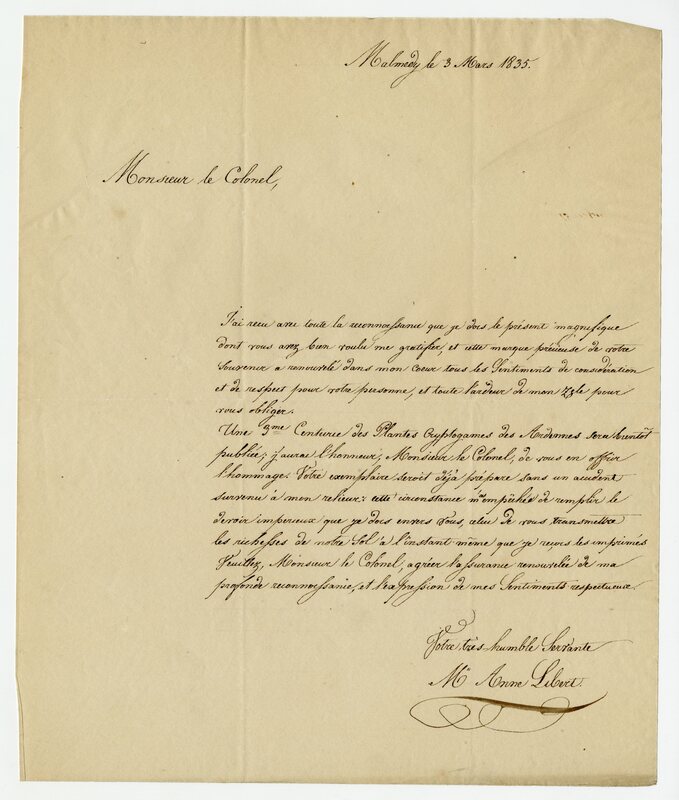 – Letter from Libert to Bory, 3 March 1835(Reproduced with permission from the Royal Botanic Gardens Victoria). 13Born in 1782, Marie-Anne Libert grew up in a large French-speaking family in Malmedy, then part of the church principality of Stavelot-Malmedy, within the Holy Roman Empire.Later on Malmedy had a complex history, becoming French in 1794, Prussian in 1815 and Belgian after the First World War. Her father, Henri-Joseph, owned property and managed a tannery. From an early age, Libert showed academic potential, and her family supported her education, initially by Sépulcrine nuns then, from the age of eleven, at a girls’ boarding school at Prüm. 16The country around Malmedy offered the budding naturalist a rich variety of flora, fauna and minerals to investigate among the densely forested hills and valleys, the heaths and the mossy bogs. Using Dodoens and a volume by an even more venerable botanist, Otto Brunfels (1488–1534),5 Libert attempted to put names to the plants that she found on her exploratory walks. The impression that she created for herself at this time was of a dedicated, but poorly resourced, autodidact. 18By her early twenties, Libert had established a sufficient reputation as a naturalist to attract the attention of her first botanical mentor, Alexandre Louis Simon Lejeune (1778-1838). After studying medicine in Paris and fulfilling military service, Lejeune established a practice at his home town of Verviers, about 20 km northwest of Malmedy. The government of the First French Empire commissioned Lejeune to compile a list of plants in the Department of Ourthe, which included Malmedy, and he asked Libert to communicate the species of her area (Kickx 1870; Morren 1868, pp. 6–7). The list (cited in Kickx 1860) became Lejeune’s first botanical publication, and Libert’s first contribution to a botanical publication. 20Four years later, Lejeune widened Libert’s circle of mentorswith a personal introduction to the famous Swiss botanist Augustin Pyramus de Candolle (1778–1841). Candolle had been commissioned by the government of the First French Empire to prepare an imperial vegetation survey, and spent his summers in field work in various Departments. On 25 August 1810, Lejeune took Candolle to visit Libert at Malmedy and the trio botanised together. 22Sans autre secours que l’Encyclopédie et la flore française elle est parvenue à déterminer presque toutes ses plantes même les lichens avec assez de précision; au moment où nous sommes allés la voir nous l’avons rencontrée revenant d’une herborisation escortée d’un domestique; elle cultive ses plantes dans un petit jardin et joint à cette activité une modestie et une simplicité remarquables (Lawalrée et al. 1965, p. 10, Beaujean 2008, pp. 41-42). 23Without any help other than the encyclopedia and flora of France she has managed to determine almost all her plants even lichens with sufficient precision; when we went to see her we encountered her returning from collecting plants escorted by a servant; she cultivates these plants in a small garden and brings to this activity remarkable modesty and simplicity. 25Mademoiselle Libert, de Malmédy, qui, dans un séjour si éloigné de toute instruction, s’est livrée à l’étude de l’histoire naturelle de son pays avec un zèle et un talent d’autant plus dignes d’éloges, que ses succès n’ont nullement altéré la modestie et la naïveté de son esprit (Candolle 1811, p. 219). 26Miss Libert of Malmedy, who, in a place so distant from all instruction, devoted herself to the study of the natural history of her country with a zeal and a talent all the more worthy of praise, as her success in no way altered the modesty and naivety of her mind. 27In this way Candolle introduced three key aspects of Libert’s character into the public sphere that were echoed by other mentors and biographers—she was talented, self-taught and modest. Moreover, it was the final characteristic that allowed her to express the first two openly without undermining her femininity or respectability. 28Candolle is also credited with directing Libert’s attention to the cryptogamic flora of Malmedy that he noticed was particularly rich in ferns, lichens, mosses, liverworts and fungi, and had been little studied (Morren 1868, pp. 405–406; Appendix 1). According to the botanist Barthélemy Charles Joseph Dumortier (1797–1878), Libert’s meeting with Candolle ‘détermina sa vocation et ses succès’ (determined her vocation and her success) (Dumortier 1865, p. 406). 31La cryptogamie qui offre tant de difficultés dans le signalement des espèces, présente dans ce pays de quoi exercer toute la sagacité d’un habile Botaniste. La pratique de la Médecine exigeant la majeure partie de mon temps, j’ai renoncé à l’étude de cette branche curieuse de la Botanique, de sorte qu’elle sera totalement décrite par Mlle. Libert (Lejeune 1813, p. 4). 32Cryptogamy, which presents so many difficulties in the description of spe-cies, in this country tests all the skills of a clever botanist. The practice of medicine requiring most of my time, I gave up the study of this curious branch of botany, so that it will be fully described by Miss Libert. 33Libert is duly acknowledged as supplying the section on vascular cryptogams (ferns) in volume two of the Spa flora (Libert 1813, pp. 272–285; Stafleu & Cowan 1981, p. 7), although Lawalrée et al. (1965, p. 117) consider that the section was in fact authored by Lejeune. 35Mlle. M. A. Libert, qui depuis quinze ans ne cesse de récolter et d’étudier les cryptogames d’une petite partie de cette région, prouve par les nombreux végétaux qu’elle a rassemblés dans son herbier, ce que peut promettre la Flore de toute la chaîne monticuleuse des Ardennes; il est à regretter qu’elle ne se décide pas encore à publier ses découvertes (Lejeune 1825, p. 8). 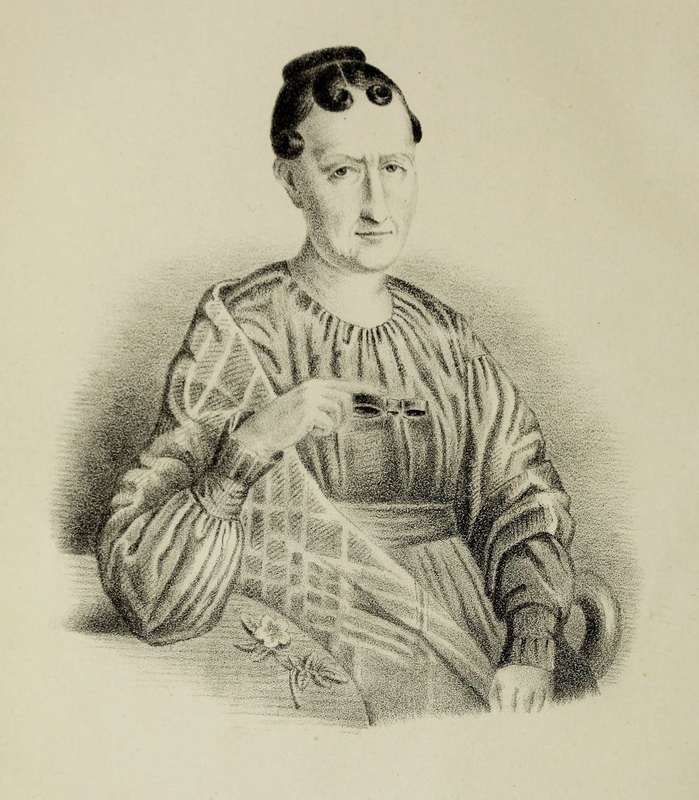 36Miss M. A. Libert, who for fifteen years has not ceased to collect and study the cryptogams of a small part of this region, proves by the many plants that she has collected in her herbarium, what the Flora of the mountainous chain of the Ardennes can promise; it is to be regretted that she has not yet decided to publish her discoveries. 1 Abbreviations for herbaria follow Index Herbariorum (Thiers, continually updated). 2 The first woman formally to describe a new fungal taxon was German governess Catharina Dörrien (1717–1795) who described two infraspecific taxa in the genus Lichen (Maroske and May 2017). 3 In her exsiccata, for No. 272, Aulographum hederae Lib., there is a label for the species, and also a label for the genus Aulographum Lib., for which the derivation is provided: “A Aυλαξ et Γραφε”. 4 That copy (identified by a handwritten note of Libert) forms part of the federal collections of the Meise Botanic Garden (Belgium) (inv. no. 15007). 5 We have not been able to identify this work. Stafleu and Cowan (1976, pp. 382–384) list several works on botany by Brunfels. Sara MAROSKE, Susan JANSON & Tom W. MAY, «JEAN-BAPTISTE BORY DE SAINT-VINCENT’S SET OF PLANTAE CRYPTOGAMICAE ARDUENNA AND THE IMPORTANCE OF MENTORS AND MODESTY IN MARIE-ANNE LIBERT’S CRYPTOGAMIC CAREER», Lejeunia, Revue de Botanique [En ligne], N° 198 (décembre 2018), URL : https://popups.uliege.be:443/0457-4184/index.php?id=1331. Royal Botanic Gardens Victoria, Melbourne, Victoria, Australia.